The compressor blade is described by pre-twisted, variable thickness, double curvature shallow shell with geometrical nonlinearity. The R-function method and the Rayleigh- Ritz approach are used collectively to calculate eigenmodes of linear vibrations. Nonlinear vibrations of shell are approximated by using these eigenmodes. The obtained finite degrees-of-freedom system has three internal resonances. The free nonlinear vibrations are studied by nonlinear modes. *Corresponding author. Tel. : +38 057 3494783; Fax: +38 0572 944635. Significant dynamics loads act on the blades of turbo machine during their operation. Therefore, blades can perform vibrations with amplitudes commensurable with their thickness. Such blade deformations are described by geometrical nonlinear theory. Many efforts have been done to study blade vibrations. Venkatsan, Nagaraj (1982) studied nonlinear vibrations of rotating blades. They came to the conclusions, that the frequency response can be hard or soft. The vibrations of turbine blades under the action of longitudinal periodic force have been considered by Chen, Peng (1995). Using geometrically nonlinear theory and finite element method, the blade nonlinear model is obtained. The vibrations of shallow anisotropic blades are treated by Abe et al. (2000). They used the Rayleigh-Ritz method to analyze linear vibrations. Nonlinear vibrations are expanded into two linear modes. The finite degrees-of- freedom model is obtained by the Galerkin procedure. Liew, Lim (1996) used energetic approach to study linear vibrations of shallow shells with different Gaussian curvature and rectangular base. Nonlinear vibrations of hydraulic turbine blades, which are modeled by pre-twisted shell with variable thickness and ring sector-shaped base, are treated by Hu, Tsuiji (1999), Sakiyama et al. (2002). The dependence of eigenfrequencies and eigenmodes on the pre-twisted angle and thickness are investigated. The papers of Hoa (1981) and Ross (1975) are devoted to linear vibrations analysis of blades, which are modeled by shells. The results of finite element analysis of turbo machine blades are compared with the experimental data of Mindle and Torvik (1987). Didkovskii (1974) analyzed the parametric vibrations of turbo machine blades in gas flow. The sufficient conditions of dynamical stability are obtained. Nabi and Ganesan (1996) compared the beam and plate models of turbo machine blades. They came to the conclusion that the plate models are better. Pisarenko, Vorob’ev (2000) concluded that the theory of pre-twisted beams gives the adequate eigenfrequencies of blade vibrations. However, the more accurate models should be used for detailed stresses analysis. 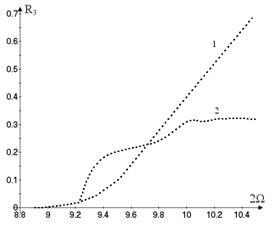 Choi, Chou (2001) analyze the blade vibrations with account of shear. The influence of shroud on vibrations is considered. Pak et al. (1992) modeled the turbo machine blades by thin elastic beams. Flexural, torsion and flexural-torsion vibrations are analyzed in detail. Breslavsky et al. (2011) studied nonlinear multi-mode vibrations of hydraulic turbine blade, both in vacuo and immersed in the fluid. The blade is modeled by shallow shell with ring sector base. The nonlinear vibrations of compressor blades are treated in this paper. Nonlinear dynamics are expanded into eigenmodes of vibrations. The finite degrees-of-freedom model is obtained. 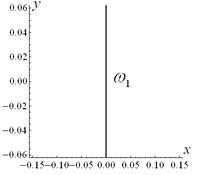 Shaw-Pierre nonlinear normal modes are used to study the vibrations accounting internal resonances. The vibrations of the compressor blades (Figure 1) are considered. The blades are modeled by pre-twisted shallow shell with trapezoidal base and variable thickness. The sketch of the shell base is presented in Figure 2. The shell is clamped on one side and it is free on others three sides. The coordinate plane ( ) passes through the chord of the root section and the central line of the blade. Moreover, the axis coincides with the central line of the blade. The geometry of the shell middle surface is complex, therefore, the shell is not considered in principal coordinates. where is the maximal thickness of the root section; is the maximal thickness of the peripheral edge. where , are displacements of the middle surface points in x, y, z directions, respectively. where , are coefficients of the first and the second quadratic form of the middle surface. where is the shell material density. In this section the linear vibrations of the shell are considered and nonlinear terms are not taken into account in the expressions (3). 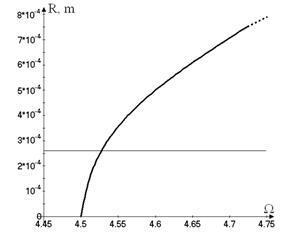 The Rayleigh-Ritz method is used to determine eigenfrequencies and eigenmodes of shell, so only the kinematic boundary conditions are taken into account. The boundary conditions on the shell free edges are natural. Therefore, they are not taken into account in linear analysis. The function can be derived for arbitrary domains with analytical boundaries. The methods for these functions construction are considered by Rvachev, Sheiko (1995). The steps of the function construction are shown in Figure 3.
where describes the trapezoidal base of the shallow shell. Using the kinetic and potential energy, the Lagrange equations with respect to the generalized coordinates are derived. where , , are unknown coefficients. As the system (13) is presented with respect to the modal coordinates, the coefficients of summands (17) with degrees lower than two are equal to zero (Jiang et al. 2005). The solutions (17) are substituted into (16) and the summands with are equated. As a result, the set of the systems of linear algebraic equations is obtained. The first system is linear with respect to the coefficients of the second degrees (i.e. the summands with ) and the second system is linear with respect to the coefficients of the third degrees (i.e. summands with ). The coefficients of the series (17) are obtained by solving sequentially these systems of linear algebraic equations. Thus, the nonlinear mode (15) can be obtained. Substituting the expressions (19) into the equations (18), the system of nonlinear algebraic equations with respect to ; is derived. This system is solved by the continuation technique (Seydel, 1997). where is the Jacobi matrix. Following the book (Parker, Chua, 1989), the fundamental matrix of the system (21) is calculated to analyze stability numerically. This matrix is a solution of the system (21) with initial conditions in the form of the identity matrix . The fundamental matrix at (where is vibrations period) is called monodromy matrix (Yakubovich, Starzhinskii, 1975). The conclusions about the stability of periodic motions are made according to the eigenvalues of monodromy matrix. In order to perform numerical analysis the steel compressor blade is considered with the following parameters (Meerovich, 1961): m, m, m, , m, , , N/m2, , kg/m3. The calculations of linear vibrations are carried out by the Rayleigh- Ritz method. The results of the eigenfrequency calculations are presented in the first row of Table 1. 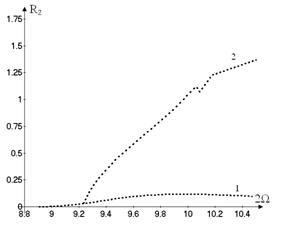 The experimental and numerical data of the previous research, which are obtained by Meerovich (1961, 1956), are presented in the second and the third row of Table 1. Figure 4 shows the nodal lines of the first six eigenmodes of the blade vibrations. These results are close to the data from (Meerovich, 1961, 1956). However, the eigenfrequency, which is close to the fourth one, is leaved out in (Meerovich, 1961). The first five eigenmodes are used in the expansions (9, 10) to obtain the finite degrees-of-freedom model of the blade nonlinear vibrations. Excluding the generalized coordinates , the system with ten degrees-of-freedom in the form of (13) is derived. 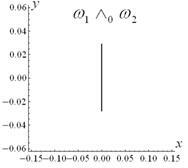 The nonlinear dynamics of this system is analyzed by nonlinear normal mode, using the results of the previous section. 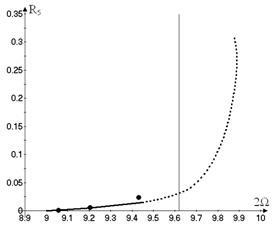 As a result of the nonlinear mode analysis, three-degree-of-freedom system (18) is derived. This system is analyzed by harmonic balance method. The vibrations with dominant generalized coordinate , which is excited due to the internal resonance (14), are analyzed. In this case, the generalized coordinate is close to zero. The backbone curve of these motions is presented in Figure 5, which shows the vibrations amplitudes versus . The stable and unstable motions are shown on this figure by solid and dotted lines, respectively. The eigenfrequencies of linear vibrations are shown by vertical lines in Figure 5. 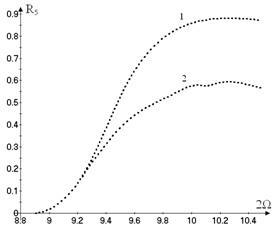 The free vibrations (Figure 5) are stable until the amplitude of is small. If the frequency is increased, the vibrations amplitude decrease quickly. Note that the vibrations and have the dominant harmonics with the frequency . As follows from Figure 5, the free nonlinear vibrations become unstable at certain values of the vibration amplitudes. The frequencies of nonlinear vibrations (Figure 5) are not close to the frequencies of linear ones. Therefore, the geometrical nonlinearity affects essentially on the shell vibrations. Now the vibrations with dominant generalized coordinate are analyzed. Such motions are denoted by the number 1 in Figure 6. This figure shows the dependence of the vibrations amplitudes on . All motions, which are shown on Figure 6, are unstable. Now another type of motions on the nonlinear mode (15) is considered. In this case the vibrations have significant amplitudes; the rest generalized coordinates are not excited. These vibrations are shown in Figure 7. The free nonlinear vibrations become unstable at some value of vibrations amplitudes. The harmonic balance method is used directly to the system of nonlinear ordinary differential equations (13) to obtain the motions, which differ from the vibrations on the considered nonlinear normal mode. As a result, additional type of periodic motions is obtained. The generalized coordinate in this regime is active too. These vibrations are shown by the branch 2 on Figure 6. This branch describes the periodic motions, which split off the motions 1 due to the period doubling bifurcation. In order to verify the obtained results the direct numerical integration of the system (13) is carried out. The initial conditions are obtained from the solution (19). The results are shown in Figure 5 and Figure 7 by dots. The data of the direct numerical integration are very close to the results of the normal mode analysis. So, the method suggested in the previous section adequately describes the system vibrations. The backbone curves are shown in Figure 8, where the vibrations amplitudes versus the frequency are plotted. Figure 8 shows the backbone curves of the different vibration modes. The horizontal line shows the thickness of the shell in the point, where the vibrations are determined. The motions with dominant generalized coordinate and with dominant coordinate are shown on Figure 8a and Figure 8b, respectively. The compressor blade is described by cantilever, pre-twisted, double curved, variable thickness shallow shell with trapezoidal base. At the first phase of the analysis the eigenfrequencies and eigenmodes are determined. The three internal resonances between the third, the fourth and the fifth vibrations eigenfrequencies are observed in the system. The different modes of the compressor blade nonlinear vibrations are described by hard backbone curves. It is shown that the amplitudes of stable vibrations of peripheral edge are commeasurable with the blade thickness in this region. The free nonlinear vibrations become unstable at certain values of the vibrations amplitudes. Moreover, the frequencies of nonlinear vibrations are not close to the frequencies of linear ones. Therefore, geometrical nonlinearity affects essentially on the shell vibrations. Abe, A., Kobayashi, Y., and Yamada, G., 2000. Non-linear vibration characteristics of clamped laminated shallow shells. J. Sound Vib. 234, 405-426. Amabili, M., 2008. Nonlinear vibrations and stability of shells and plates. Cambridge University Press, New York. Avramov, K.V., 2008. Analysis of forced vibrations by nonlinear modes. Nonlinear Dyn. 53, 117-127. Avramov, K.V., Tyshkovets, O., Maksymenko-Sheyko, K.V., 2010. Nonlinear dynamics of circular plates with cutouts. R-function method. ASME J. Vib. Acoust. 132, №5, 110-135. 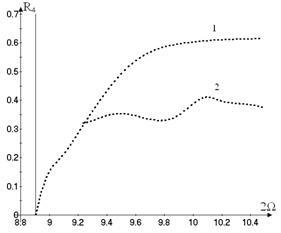 Breslavsky, I., Avramov, K.V., Nonlinear modes of cylindrical panels with complex boundaries. R-function method. Mecc., in press. Breslavsky, I.D., Strel’nikova, E.A., Avramov, K.V., 2011. 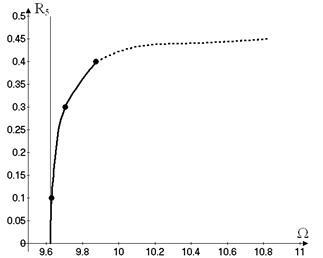 Dynamics of shallow shells with geometrical nonlinearity interacting with fluid. Comput. Struct. 89, 496-506. Chen, L.W., Peng, W.K., 1995. Dynamic stability of rotating blades with geometrical non-linearity. J. Sound Vib. 187, 421-433. Choi, S.-T., Chou, Y.-T., 2001. Vibration analysis of elastically supported turbomachinery blades by the modified differential quadrature method. J. Sound Vib. 240, 937-953. Didkovskii, V.N., 1974. Parametric vibrations of turbomachines in a flow. Strength Mater. 8, 9-13. Goldenveizer, A.L., Lidskii, V.B., Tovstik, P.E., 1979. Free vibrations of thin elastic shells. Nauka, Moscow (in Russian). Grigoluk, E.I., Kabanov, V.V., 1978. Stability of shells. Nauka, Moscow (in Russian). Hoa, S.V., 1981. 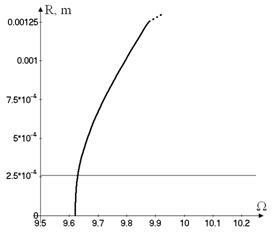 Vibration frequency of a curved blade with weighted edge. J. Sound Vib. 79, 107-119. Hu, X.X., Tsuiji, T., 1999. Free vibration analysis of curved and twisted cylindrical thin panels. J. Sound Vib. 219, 63-68. Jiang, D., Pierre, C., Shaw, S.W., 2005. The construction of non-linear modes for systems with internal resonance. Int. J. Non-Linear Mech. 40, 729-746. Kurpa, L., Pilgun, G., Amabili, M., 2007. Nonlinear vibrations of shallow shells with complex boundary: R- functions methods and experiments. J. Sound Vib. 306, 580-600. Liew, K.M., Lim, C.W., 1996. Vibration of doubly-curved shallow shells, Acta Mech. 114, 95-119. Meerovich, I.I., 1956. Vibrations of slightly curved and pre-twisted blades. Trudy CIAM 271. Oborongiz, Moscow (in Russian). Meerovich, I.I., 1961. Stress distribution in vibrating compressor blades. Oborongiz, Moscow (in Russian). 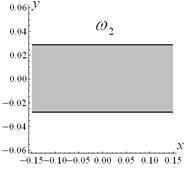 Mikhlin, Yu.V., Avramov, K.V., Nonlinear normal modes of mechanical systems. Part I: Theory. Appl. Mech. Rev., in press. Mindle, W.L., Torvik, P.J., 1987. Multiple modes in the vibration of cantilevered shells. J. Sound Vib. 115, 289-301. Mohamed Nabi, S., Ganesan, N., 1996. Comparison of beam and plate theories for free vibrations of metal matrix composite pre-twisted blades. J. Sound Vib. 189, 149-160. Pak, C.H., Rand, R.H., Moon, F.C., 1992. Free vibrations of a thin elastica by normal modes. Nonlinear Dyn. 3, 347-364. Parker T.S., Chua L.O., 1989. Practical numerical algorithms for chaotic systems. Springer-Verlag, New York. Pisarenko, G.S., Vorob’ev, Yu.S., 2000. Issues of simulation of turbomachine blade vibration. Strength Mater. 32, 487-489. Ross, C.T.F., 1975. Free vibration of thin shells. J. Sound Vib. 39, 337-344. Rvachev, V.L., Sheiko, T.I., 1995. R-function in boundary value problem in mechanics. Appl. Mech. Rev. 48, 305-316. Sakiyama, T., Hu, X.X., Matsuda, H., Morita, C., 2002. Vibration of twisted and curved cylindrical panels with variable thickness. J. Sound Vib. 254, 481-502. Seydel, R., 1997. Nonlinear computation. Int. J. Bifurc. Chaos 7, 2105-2126. Shaw, S.W., Pierre, C., 1993. Normal modes for nonlinear vibratory systems. J. Sound Vib. 164, 58-124. Venkatsan, C., Nagaraj, V.T., 1982. Non-linear flapping vibrations of rotating blades. J. Sound Vib. 84, 549-556. Yakubovich, V.A., Starzhinskii, V.M., 1975. Linear Differential Equations with Periodic Coefficients, Wiley, New York. Fig.3. The steps of the construction of the function , which describes the clamped part of the shell boundary. The regions, where the function is positive, are shown by grey color. The black lines show the zero of the function. Fig.8. 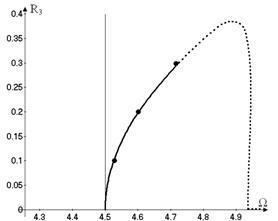 The backbone curves of shell vibrations with dominant general coordinates: a. ; b. .